Sunlight glints off of hydrocarbon seas on Saturn's moon Titan, as seen here in near-infrared light by the Cassini spacecraft. In the search for life beyond Earth, scientists have justifiably focused on water because all biology as we know it requires this fluid. A wild card, however, is whether alternative liquids can also suffice as life-enablers. For example, Saturn's frigid moon Titan is awash in inky seas of the hydrocarbon methane. Yet in a hydrocarbon medium on Titan, these molecules could never perform their profound chemical duties. Other molecules must therefore step up to the plate if non-water-based alien life is to operate and evolve in a Darwinian sense, with genetic changes leading to diversity and complexity. A schematic of a DNA molecule. The four nucleobases – A, T, C and G – are shown at right. Note the repeating backbone of oxygen, carbon and phosphorus throughout the double helix structure of DNA. A new study proposes that molecules called ethers, not used in any genetic molecules on Earth, could fulfill the role of DNA and RNA on worlds with hydrocarbon oceans. These worlds must be a good deal toastier though than Titan, the study found, for plausibly life-like chemistry to take place. "The genetic molecules we have proposed could perform on 'warm Titans,'" said paper lead author Steven Benner, a distinguished fellow at the Foundation for Applied Molecular Evolution, a private scientific research organization based in Alachua, Florida. Bigger molecular cousins to Titan's methane, such as the octane that helps fuel our vehicles, would also make for far more suitable solvents. Although no "warm Titans" close-in to their host stars have turned up so far in exoplanet exploration, Benner is hopeful there are worlds aplenty that fit the bill. "Within our own solar system, we do not have a planet big enough, close enough to the sun, and with the right temperature to support warm hydrocarbon oceans on its surface," said Benner. "But each week, astronomers are discovering new solar systems other than our own." The new paper appears in the March issue of the journal Astrobiology and was funded in part by the Exobiology & Evolutionary Biology element of the NASA Astrobiology Program. On a fundamental level, the development of life on Earth has been a push-and-pull between molecules changing and staying the same. For an organism to reproduce and make copies of itself, the vast majority of its genetic information must be conserved if the offspring are to survive and still carry life forward. But if life does not change and adapt to inconstant environmental conditions, it will die out. The environmental curve balls to life include temperature swings and varying water and nutrient availability. DNA and RNA allow for a biological version of the axiom "the more things change, the more they stay the same." Individual "letters," or nucleobases, in the four-letter code of DNA and RNA can mutate without destroying the molecule's overall form and function. An artist's impression of the low-lit surface of Titan under the moon's thick, orange haze, with liquid hydrocarbons pooling and eroding the surface much like water on Earth. The general structure, and therefore the general behavior, of DNA and RNA remains the same because of repeating elements in the chemical's backbone, or main scaffolding. The molecules possess an outwardly negative charge that repeat along their backbones, which allows DNA and RNA to dissolve and float freely in water. In this fluid medium, the DNA and RNA can interact with other biomolecules, leading to complexity in biological systems. "This is the central point of the 'polyelectrolyte theory of gene,' which holds that any genetic biopolymer able to support Darwinian evolutionoperating in water must have an ever-repeating backbone charge," explained Benner. "The repeating charges so dominate the physical behavior of the genetic molecule that any changes in the nucleobases that influence genetic information have essentially no significant impact on the molecule's overall physical properties." All of which is well and good for us water-based organisms. 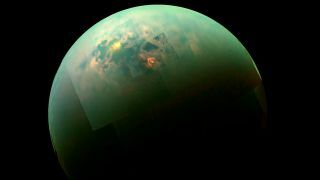 The trouble is, for waterless worlds like Titan where hydrocarbons reign, molecules like DNA and RNA would never cut it. These biomolecules cannot dissolve, as required, in hydrocarbons to allow for life's microscopic bump-and-grind. "None of these molecules have any chance of dissolving in a hydrocarbon ocean like on Titan or on a warm Titan," said Benner. More bothersome still, molecules with any sort of outward charge goop up in hydrocarbons. The blueprints of life on Earth as contained in DNA and RNA cannot translate to hydrocarbon-logged worlds. Is life, at least as we can conceive of it, impossible amidst hydrocarbons? Benner and colleagues think not. Compounds called ethers, when strung together form complex "polyethers," can likely perform in a manner that stays faithful to the polyelectrolyte theory of gene. Ethers, like DNA and DNA, have simple, repeating backbones, in their case of carbon and oxygen. Structurally, ethers do not have an outward charge, like DNA and RNA. But ethers do possess internal charge repulsions that open up useful "spaces" within the molecules, wherein small elemental chunks can go that work like the DNA's and RNA's nucleobases. Habitable zones beyond the conventional one for water might exist for solvents such as hydrocarbons. Hydrocarbons, like water, can be solids liquids or gases, depending on temperature and pressure. As with the astrobiological hunts for water-based life, the liquid phase of hydrocarbons is the one of interest, because in solids (like ice), biomolecules cannot interact, and in gases (water vapor), the medium is too thin to support enough interaction. As a rule, the temperature range at which a hydrocarbon is a liquid goes up as the hydrocarbon becomes longer. Methane, the simplest, shortest hydrocarbon with a single carbon atom linked to four hydrogen atoms, has a very narrow liquid range—between about -300 and -280 degrees Fahrenheit. Inconveniently, the solubility of ethers plummets when getting down into these Titanian chills. According to Benner's study, and to the disappointment of many scientists, Titan looks like a very unlikely abode for aliens. "We have shown that the methane oceans at Titan are likely to be too cold to hold any genetic biopolymer," said Benner. A better bet for life than methane-ocean worlds are those instead covered by propane. This hydrocarbon has three carbon atoms to methane's one, and is another household name here on Earth as a gaseous fuel. It can stay liquid over a much broader and more suitable-for-chemistry range of -300 to -40 degrees Fahrenheit. Still better than propane is octane. This eight-carbon molecule does not freeze until about -70 degrees Fahrenheit, nor does it turn into a gas until reaching a quite-hot 257 degrees Fahrenheit. That broad a range with sufficient ether solubility suggests that warm Titans could harbor a truly alien biochemistry capable of evolving complexity in a Darwinian manner. These worlds could be found in a fairly wide hydrocarbon "habitable zone"around other stars. The hydrocarbon habitable zone is akin to the familiar water-based zone, wherein a planet is neither too close nor too far from its star to have its water completely boil or freeze away. Hydrocarbon worlds of interest need not be Titan-like, after all, in that they do not have to be moons of gas giants. Warm Titans could actually be more like oily Earths or super-Earths, drenched in octane. As research continues, new and exotic solvents other than water and hydrocarbons could yet emerge as plausible milieus for life's dealings. "Virtually every star has a habitable zone for every solvent," said Benner.